Newport Selectboard Hear Thoughts on Septage Ordinance. Bert Spaulding Sr. and David Kibbey spoke to the Newport Selectboard on Monday about land regulation and septage application in Newport. 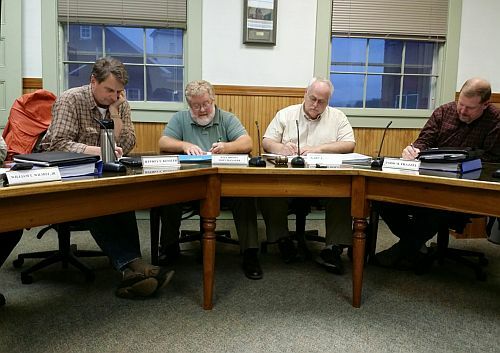 The two voiced their displeasure with a proposed Zoning amendment where septage application would be prohibited in entire the town of Newport. The proposed ordinance was spurned after the Zoning board upholding the ruling of Zoning Administrator – Julie Magnuson disallowing the activity of Commercial Septage Hauling on a property owned by Richard D. Kelley Jr, on 566 Unity Road. Kelley planned to process septage from his Septic business on that property and grow hay. Spaulding argued that a farm is not a commercial enterprise and suggested the town should get a second opinion from another lawyer. Kibby handed a packet of rules and regulations regarding use of septage for farming. The Board thank the two for their input. The debate will continue at another public hearing for the change in the Zoning Ordinance on Aug. 18 when Michael Rainey from D.E.S. Wastewater Engineering Bureau will be present to answer questions from the public. Time and place of the hearing has not been set. NH State Troopers Say NH Drivers Obeyed Hands Free Law Over July 4 Weekend. State Troopers maintained a highly visible presence throughout the State to assure safe holiday travel this past weekend. Those efforts included making 2,719 vehicle stops resulting in: 483 citations for speeding, 1,665 warnings, 332 citations for other motor vehicle violations, and 42 citations for Driving after Suspension and 22 DUI arrests. Another 81 criminal arrests were also made. Troopers wrote 96 citations and 47 warnings for, “Use of Mobile Electronic Devices While Driving.” Troopers say drivers were found to be overwhelmingly compliant with the new law, which went into effect July 1. Despite their efforts, the NH State Police said there were two fatal accidents over the holiday weekend. NH DOT estimates that construction on the new RT 4 Bridge that crosses the Mascoma River is Lebanon will be completed in June of 2016. The old bridge now red listed was built in 1927 is still in use today with about 10,000 cars using it daily. The estimated cost of the new bridge is $8.9 million dollars. VSP Seeks Information on Attempted Homicide Suspect. The VT State Police is asking for the publics’ help with last Monday’s shooting in Westford Vt. Investigators are looking to speak to anyone who saw Veronica Lewis at the scene of the shooting on 173 Pettingill Road in Westford, and how Lewis may have left the scene and travelled to Burlington. These events would have occurred sometime after 12:30pm on Monday, June 29, 2015. Lewis is accused of 1st degree attempted homicide for shooting Darryl Montague, a firearms instructor two times in the jaw and once in the abdomen. Montague is a resident of Claremont, remains in a coma after 5 operations in a Burlington VT hospital . Anyone with information on Lewis should call Vermont State Police Detective Michael Kamerling at the Williston barracks, at 802-878-7111. Investigators are only looking for information, not your name.